In this day and age, many consumers dream of owning a refrigerator that keeps food fresher for longer. They wish for their fridge compartments to be odour-free, flexible in terms of space usage and energy-efficient. Malaysians need not look further as Samsung today introduced their two-door RT7000 Refrigerator with Twin Cooling Plus technology. Previewed last month at the Samsung Southeast Asia Forum 2016 held in Kuala Lumpur, Samsung continues to strive to bring the best features and top-of-the-line home appliances to every household. Up until the two-door RT7000 Refrigerator, top-mounted refrigerators faced the challenge of keeping food fresh and odour-free due to the sharing of a single evaporator between the fridge and freezer compartments. As a result, odour mixture occurs between both compartments, affecting the freshness and taste of the food stored in the refrigerator. With the Twin Cooling PlusTM technology, the two-door RT7000 Refrigerator has an independent cooling system with two separate airflows catering to their respective compartments – this prevents the cross-flow of odours, maintaining the natural flavour of the food. The Twin Cooling Plus technology ensures a constant optimum humidity level and ideal temperature. With a humidity level of up to 70% in the fridge, fruits and vegetables no longer need a dedicated vegetable box or extra wrapping to maintain their crunch and fresh condition, even days after their purchase. This feature enables the entire fridge to be used as a vegetable and fruit box, increasing storage capacity. Home-owners no longer need to worry about their food drying up in the fridge. The two-door RT7000 Refrigerator is fit for every family and caters to different needs and lifestyles, thanks to their smart conversion feature. With five different modes available (regular mode, energy saving mode, vacation mode, fridge-max mode, and mini-fridge mode), this technology allows for more efficient usage. The different modes refer to the settings of the fridge and freezer compartments; where each compartment can be converted to have the same settings as the other, or a compartment can be completely idle. Owners benefit by saving more energy, experiencing more flexibility in space usage and gaining more control over their refrigerator. To add onto the refrigerator’s adaptability, the CoolSelect Plus feature enables different temperature settings depending on the family’s needs; where the temperature of the fridge compartment can be adjusted to better fit what is being stored. The two-door RT7000 Refrigerator is built to be a storage haven of fresh ingredients; hence, the RT7000 Refrigerator comes in nine different capacities. Regardless of the size of the household, Samsung’s newest refrigerator can easily store a week’s worth of grocery shopping for the whole family. An extension of its large capacity is the refrigerator’s Big Guard feature where door compartments are built to hold larger items such as gallon milk bottles and large juice boxes. 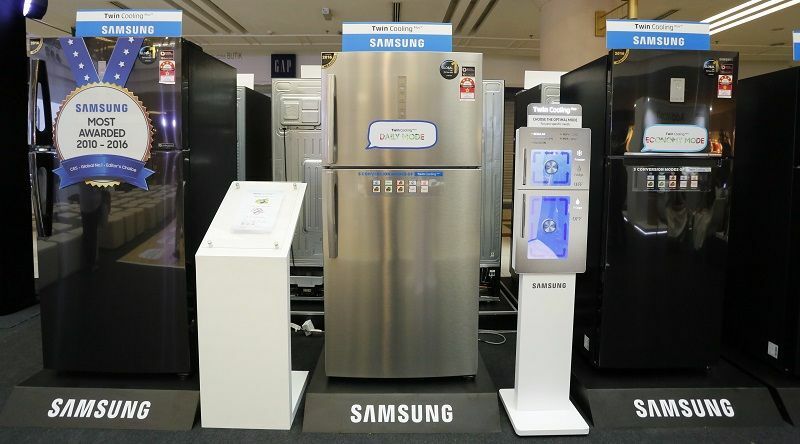 In conjunction with the launch of Samsung’s new two-door RT7000 Refrigerator with Twin Cooling Plus™ technology, consumers can enjoy Parent’s Day Promotion during a week-long of digital appliances roadshow held at 1 Utama Shopping Centre. 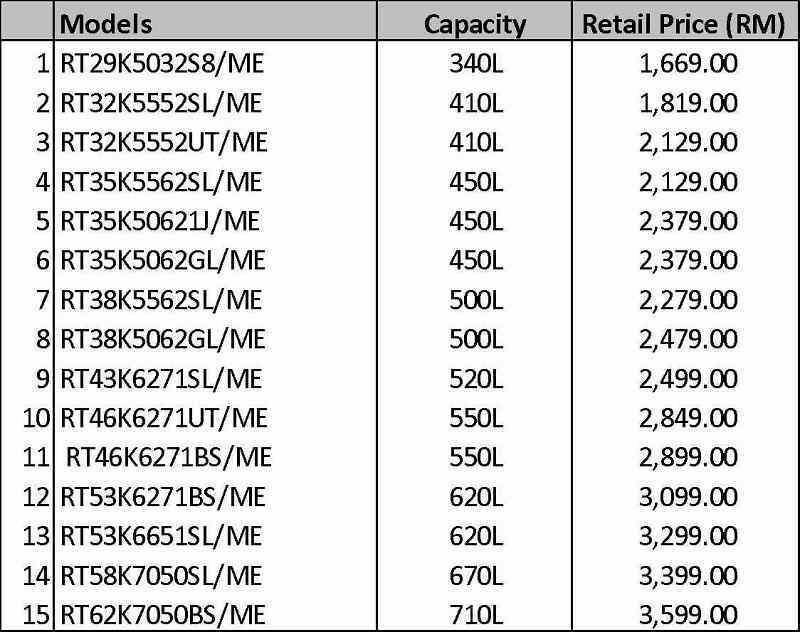 The new refrigerator is also available at all Samsung stores and selected authorised dealerships at a recommended retail price starting from RM 1,699 – RM 3,599.